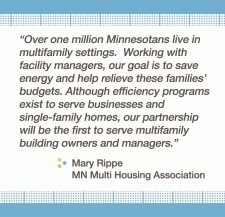 This spring, Center for Energy and Environment is coming together with five of our closest regional housing and energy allies to develop a toolbox of new, one-stop support services for Minnesota’s multifamily building owners and managers. For many years, CEE, Neighborhood Energy Connection, Minnesota Multi Housing Association, Family Housing Fund, Greater Minnesota Housing Fund, and Elevate Energy have collaborated in twos and threes on various projects — but until now the six of us had never worked together quite like this, behind one shared vision: We aim to increase efficiencies in Minnesota’s multifamily housing, especially among low- income populations. “Multifamily housing” means all residential buildings — from rented apartments to owned condos — that provide separate living spaces for more than one family. Our “One-Stop Partnership for Multifamily Housing” intends to take advantage of each partner’s strengths to lower utility bills in multifamily properties by developing a one-stop, easy-to-use energy-efficiency program tailored for the multifamily sector. In addition to the group’s combined operational power and our strong network of housing and energy field relationships, we’re also exploring financing options to help owners in need of significant improvements. Read the full story at Center for Energy and Environment.